Professor Murray graduated from Yale University in 1963 with honors in history. He then served five years as an officer in the United States Air Force, including a tour in Southeast Asia with the 314th Tactical Airlift Wing (C-130s). He returned to Yale University where he received his Ph.D. in military-diplomatic history. He taught two years in the Yale history department before moving on to Ohio State in 1977 as a military and diplomatic historian; in 1987 he received the Alumni Distinguished Teaching Award. 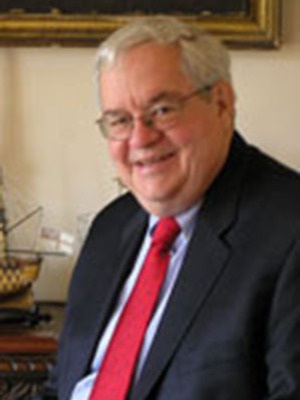 Professor Murray has taught at a number of academic and military institutions, including the Air War College, the United States Military Academy, and the Naval War College. He has also served as a Secretary of the Navy Fellow at the Navy War College, the Centennial Visiting Professor at the London School of Economics, the Matthew C. Horner Professor of Military Theory at the Marine Corps University, the Charles Lindbergh Chair at the Smithsonianís Air and Space Museum, and the Harold K. Johnson Professor of Military History at the Army War College. He served as a consultant with the Institute of Defense Analyses, where he worked on the Iraqi Perspectives Project. In 2008 he completed two years as the 1957 Distinguished Visiting Professor of naval heritage and history at the U.S. Naval Academy. For the past two years, he was a Minerva fellow at the Naval War College. He is the author of The Change in the European Balance of Power, 1938-1939, The Path to Ruin (Princeton University Press, 1984); Luftwaffe (Nautical and Aviation Press, 1985); German Military Effectiveness (Nautical and Aviation Press, 1992); The Air War in the Persian Gulf (Nautical and Aviation Press, 1995); and Air War, 1914-1945 (Weidenfeld and Nicholson, 1999). Professors Murray and Allan Millett have published an operational history of World War II, A War To Be Won, Fighting the Second World War (Harvard University Press, 2000) Professor Murray was a major contributor to The Cambridge History of War, ed. by Geoffrey Parker (Cambridge University Press) and also authored with Major General Robert Scales, Jr. The Iraq War, A Military History (Harvard University Press, 2003). He has also edited with Allan Millett a number of books on the implications of the past for current military thinking: Military Effectiveness, three volumes (Allen and Unwin, 1988; by Cambridge University Press); Calculations, Net Assessment and the Coming of World War II (Free Press, 1992); and Military Innovations in the Interwar Period (Cambridge, 1996). Professor Murray has also edited with MacGregor Knox, The Making of Strategy, Rulers, States, and War (Cambridge University Press, 1994) and The Dynamics of Military Revolution, 1300-2050 (Cambridge, University Press, 2001). He also edited with Richard Sinnreich The Past as Prologue, The Importance of History to the Military Profession (Cambridge University Press, 2006). In 2009 he published The Making of Peace: Rulers, States, and the Aftermath of War which he edited with James Lacey (Cambridge University Press, 2009); and Conflicting Currents: Japan and the United States (Praeger, 2009). In 2011 he published three books: The Shaping of Grand Strategy, Policy, Diplomacy, and War, which he edited with Richard Sinnreich and James Lacey (Cambridge University Press), War Strategy and Military Effectiveness (Cambridge University Press), and Military Adaptation in War, For Fear of Change (Cambridge University Press). In 2012 he and Peter Mansoor published Hybrid Warfare with Cambridge University Press. Professor Murray also completed The Iran-Iraq War, 1980-1988 with Kevin Woods (Cambridge University Press, 2014); and Successful Strategies with Richard Sinnreich (Cambridge University Press, 2014); A Savage War with Wayne Wei-siang Hsieh (Princeton University Press, 2016), America and the Future of War: The Past as Prologue (Hoover Institution Press, 2017).